t is a cold trip. Rain/sleet/snow, frozen curbside puddles, one day someone told me it was 15° with wind-chill. Cab into Manhattan from JFK with little round Russian lady cab driver, was formerly piano teacher in Russia. I stay at the Mayflower. The first night I walk up to Cafe Fiorello. It is a cold night. The place is elegant and bright. The people working there are beautiful. The hostess is tall, angelic face, wavy hair framed by background light. A bunch of handsome young Italian waiters. The patrons are classy. Each booth cozy in candlelight. Fantastic food. Mussels in tomato broth and garlic, a market steak, fries, salad, glass of Chianti, cappuccino, tiramisu. I tell ya . . . The elegance of European influence. Been so long in rural California I tend to forget it. Taste. Quality. Pride in looks, clothing. The meal is a work of art. The workers are artists. The art of food and service. Pursuit of excellence. Its one of those New York moments. That morning Id gotten up at 4:30, driven down the dirt road thru the puddles, 1-1/2 hours to SFO, and now, later the same day, I am on another planet. 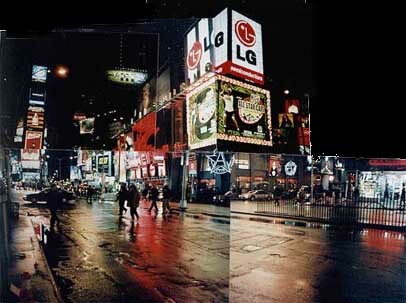 imes Square is visually fascinating. The signs, the lights, the colors. Thursday after a meeting at Bertelsmanns well-guarded U.S. headquarters on Broadway and West 45th, I get out into the streets around 6:00, and baby is it cold outside! Also colorful, so I get out my little Minox and fight freezing fingers to shoot Times Square. Shining lights on wet streets look like spilled paint. unday morning I head toward Cafe des Artistes for breakfast. The day before George had told me to go there, that it was funky. When I walk in in my home-made knit hat and Patagonia coat, I feel awkwardly outclassed. People are tastefully and impeccably dressed  they look good! Georges little joke. It would take about $2K at Wilkes-Bashford for me to dress for this place. Two women in furs in front of me talking to the suave French maître d; they are going to have to wait for a table. A beautiful room, lovely fresh flowers on each table, morning sunlight filtering thru eastern windows. Another world. I step back out into the cold and walk westward. In a few blocks I see a cozy place, Cafe Mozart. Its a wonderful spot! Blueberry pancakes, cappuccino. Warm, bustling, hip. A young woman comes in, sits down at the piano, and plays Mozart. Racks of newspapers. Crowded on Sunday, but pretty empty weekdays. A great place to get breakfast, read the papers, start the NYC day. The Boardwalk is oak! Like 2 miles of it. 2" x 4" oak planks screwed to girders with stainless steel grabbers. It’s a beautiful boardwalk. Its on the water, so there are reflections and vistas and light. The locals are Russian. I mean its like youve landed on the shores of the Black Sea. Babushka-clad strollers. 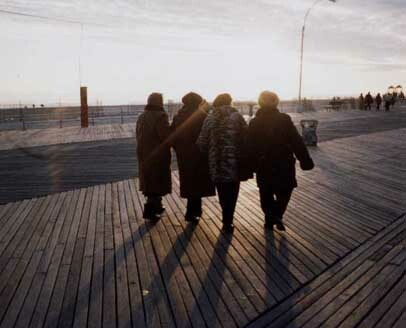 Couples in fur-lined coats walking along the Boardwalk. 3-year olds speaking Russian. A group of eight old ladies sitting on a bench, talking intently, looking like an oil painting from the 1800's. oney Island is weird, but kinda cool. A spooky burned out roller coaster  the old Thunderbolt. The Parachute Jump, a magnificent Eiffel tower-like structure, maybe 200 feet tall, moved after the 1939 New York Worlds Fair. (People were hoisted to the top, then dropped in freefall until cables took up the slack.No thanks!) Former elegance in an abandoned old Venetian-portalled building, Childs Restaurant, built in 1923. Its yellow stuccoed walls decorated with terra cotta tiles in a sea motif. I go out into the main avenue of Brighton Beach. The El casts deep shadows on what would otherwise be a sunny street. I enter the Cappuccino Cafe, a Russian place despite the name, and have cheese blintzes and cappuccino and sit at a table with a woman who knows not a word of English. Farther on, a carousel with painted horses and dragons, lovingly restored and operated. week of night culture. The Moisseyev Dancers with Bruce at Carnegie Hall (Its a beautiful hall, painted soft warm yellow and rust colors so the hall glows.) A blues band Friday night at Mannys Car Wash. Saturday night Jorma Kaukonnen and another acoustic guitarist, two, just count em, two instruments, and a marvelous night of funky blues and Hot Tuna type songs and about 300 people at the Bottom Line. Jorma fans, they knew the songs. Hes a great guitar player. One night to see the Off-Off-Off- Broadway play, Forbidden Broadway, a take-off on everything in the neighborhood. Two actors, two actresses, one piano, and wicked satires on Cabaret, Miss Saigon, The Lion King, Cats . . . they rip and parody the sacred cow shows. The honorable law and order mayor gets blasted, as does the mousifecation and corporatization of Times Square. Right on! unday I go to the Guggenheim. Its a great museum. They have a show of European oil painters. I get in for a senior without having to show an I.D. Thats not good! I love a couple of the paintings. A 1907 Matisse, Portrait of Greta Prozor, and Picassos 1907 Bust of a Woman. On a cold afternoon I walk through the park and stop to look down on the ice rink, where about 300 skaters circle to music, with the 56th street skyline in the background. Spectacular! ne morning I take the subway down to Wall Street. Theres an old church, the Trinity Cathedral, with a graveyard with grass and trees. A lot of street food carts, sausages, kabobs, chicken. The Staten Island Ferry is there and, I didnt realize it, but the Museum of the American Indian (or maybe part of it) has moved down there. (I went up to 176th or wherever it used to be twice and it was well worth the trip.) So next trip its down to Manhattan South for further exploration. n aquarium with a 30' Beluga whale. Walruses (they're huge!). In the Aquarium there's a father with a 3-year old and his 2-year old little brother. They're looking into a tank with corrals and sponges and a 5" diameter clam. The 3-year old turns to his little brother and says, "It's a giant clam!" The father, an earnest Yuppie type doing "quality time" duty today, says, "No Aaron, that's not a giant clam, don't you remember, we saw a giant clam and it was much bigger." The kid thinks about it for a minute and then turns to his brother: "It's a giant clam!" "No, says Dad, "remember when we went to the aquarium and saw the giant clams, they're much bigger. 15 times as big as this one."